Private practices and health systems alike continue to evaluate their options for working together during the continuing evolution of healthcare delivery. Over the past five years, many physicians from all specialties and practice structures have completed transactions with health systems. Many, if not most, of these arrangements are through employment vehicles. However, growing in prevalence are professional services agreements (PSAs), which are the model and structure of choice for thousands. 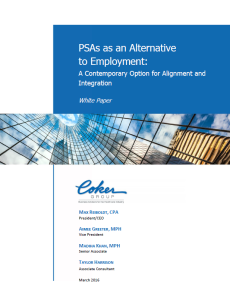 Readers will learn why PSAs could be the best option for alignment for many organizations in the emerging landscape of “volume-to-value” reimbursement.